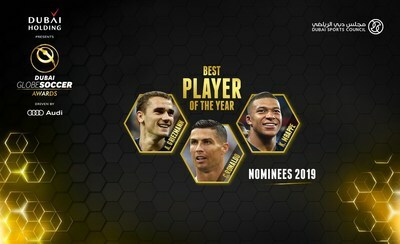 Cristiano Ronaldo and French pair Kylian Mbappé and Antoine Griezmann will fight it out for the Best Player Award when the 10th edition of the Globe Soccer Awards is staged at Dubai's Madinat Jumeirah on January 3, 2019. The Portuguese legend, a record four-time winner and eight-time nominee, will be looking to make it a third Globe Soccer Best Player Award in as many years but he faces a battle for the crown from French pair Griezmann and Mbappé, who lit up the world stage in Russia this summer. "The 10th anniversary of the Globe Soccer Awards is a special milestone, so we are delighted to announce Cristiano Ronaldo, Antoine Griezmann and Kylian Mbappé as the finalists in the Best Player category," said Globe Soccer CEO Tommaso Bendoni. Deschamps, only the third man to win the FIFA World Cup as both player and manager, is in contention for the Best Coach Award alongside former Real Madrid boss Zinedine Zidane, Atlético Madrid's Diego Simeone, Jürgen Klopp of Liverpool and Juventus coach Massimiliano Allegri. Among the other early nominees announced by Globe Soccer, super-agent Jorge Mendes will battle it out with Jonathan Barnett and Stefano Castagna in the Best Agent category, while 2018 UEFA Champions League finalists Real Madrid and Liverpool will once again go head-to-head this time for the Best Team Award alongside Atlético Madrid.